Dr. Bruce T. Liang, MD. Affiliation: Dr. Liang is director of the Pat and Jim Calhoun Cardiology Center and chief of cardiology at UConn School of Medicine. 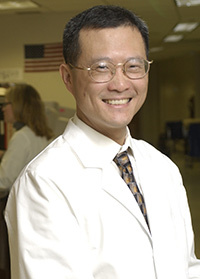 Dr. Liang has studied ischemic preconditioning and cardioprotection for nearly two decades. He was among the first to elucidate a protective role of adenosine A3 receptors in the heart and to demonstrate a role of phospholipases C and D in muscle protection. Dr. Liang has an active clinical practice in cardiology including caring for patients with atrial fibrillation.